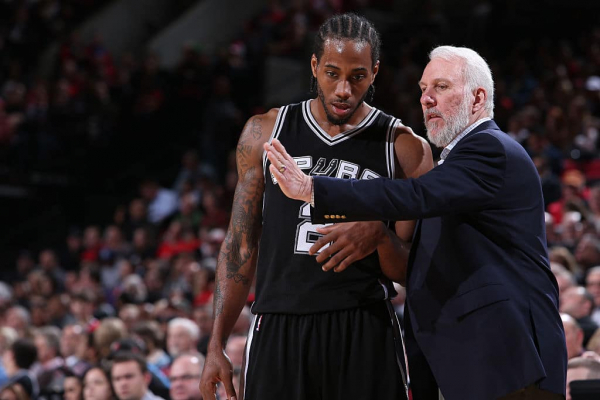 Kawhi Leonard and San Antonio Spurs head coach Gregg Popovich have officially met. What that means for their future together, though, remains unclear. The meeting between the two faces of the Spurs’ franchise was done professionally and confidentially, league sources said. . . . The Spurs’ front office and Leonard’s representatives had been in communication since the season ended, and Leonard has been in contact with coach Gregg Popovich, league sources said. Leonard spent most of the second half of the season rehabbing his injury in New York, where his medical team was based and where he trained with Spurs staffers. He has returned close to full health from the lingering quad injury. For weeks, Popovich has been working to set up a meeting with Leonard to discuss the issues that have fractured the franchise’s relationship with the All-NBA forward and caused him to make public in the media his desire to be traded, league sources said. Leonard wants a trade to Los Angeles, preferably the Lakers over the Clippers, league sources said. He has privately maintained that he no longer wants to play in San Antonio and will eventually alert rival teams considering trades for him that his intention is to sign in Los Angeles when he can become a free agent in 2019, league sources said. . . .
Leonard had told confidants that he did not want to sit down with Popovich and has been purposely difficult for the Spurs to reach recently. Among the issues, Leonard is angry over what he believes was the Spurs’ mishandling of his quad injury, and he remains irate with public comments from teammate Tony Parkerand Popovich that he felt were not supportive of him, league sources said. Draft night looms large for both parties. If Leonard reiterated his desire to leave while speaking with Popovich, chances are this dilemma reaches a quasi-resolution pretty quickly. The Spurs will not settle for lowball offers in Kawhi talks, but they’re also not an organization that wants to let this drag out. At the same time, they don’t hold much leverage if Leonard has made it clear around the league he intends to sign with a Los Angeles team next summer. Sure, they don’t have to adhere to his list. The Indiana Pacers flipped Paul George to the Oklahoma City Thunder, as opposed to the Lakers, just last summer. But that situation was different. Though George, like Leonard, was on an expiring contract (player option), he wasn’t working his way back from an injury-plagued campaign that limited to just 14 appearances. Don’t be surprised, then, if the Spurs elect to wait out the trade market or even try entering next season with Leonard on the roster in hopes of rehabilitating his value in advance of the February deadline.